1. Cut slice of banana that are equal to the width of the bacon. Wrap the bacon around the banana in one layer only, and secure with a toothpick. 2. Prepare the Mahi by first removing the blood line, then cleaning off any skin that might still be attached. Then slice it into 3/8" wide strips. 2. Chop the Jalapeno, and Red Bell Pepper. Add the oil to a Teflon Pan, then the butter. When the butter has melted, add the peppers, and cook, over medium / high heat until they begin to get soft (about 5 minutes). 3. Add the meat, turn the burner to high, and cook another 5 minutes or so. Try not to overcook the Mahi, because it will fall apart. If you prefer a wet filling, you could add the Enchilada Sauce now instead of during assembly. 4. Place 2 Tortillas in a microwave, and Nuke for 30 seconds to soften. 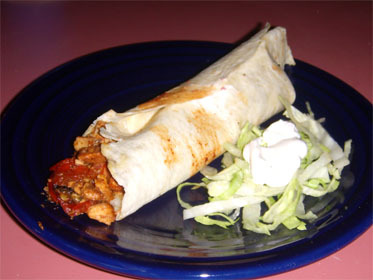 Place it on a plate, add the meat mixture, cheese, sauce, lettuce, and sour cream. Roll once, then fold in the right side, and continue rolling.